Regular readers of this blog will be no stranger to Guy Himber’s Crazy Bricks, which has been classing-up the world of figs for years now with top hats, skulls, and all manner of other unique accessories. 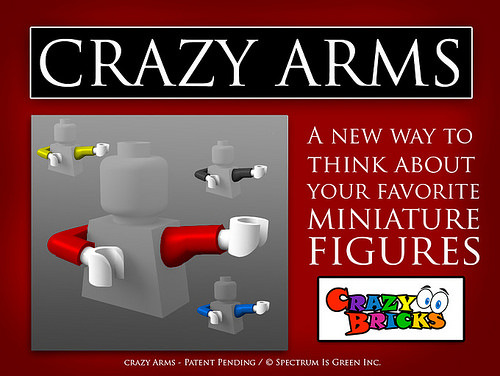 But Guy’s latest offering, Crazy Arms, could be a game changer for mini-fig fans. These patent pending replacement arms not only offer better poses for your figs, but also solve the problem of how hard it has always been to remove and re-insert the standard arms into the standard torso. How? Watch the video below to find out! Crazy Arms will only be available through a Kickstarter project. So if you want to get your posable fleshy hands on some, you’d better back it before the end of the month! Awesome idea, I pledged for 4 sets.